Your backyard pond can be a source of great pleasure and enjoyment, adding to your landscape what few other features can; including, sound, movement, and wildlife attraction. 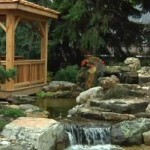 However, while a water feature has potential to add so much to your landscape, it can be difficult to make it actually belong with the landscape. Build it a bit larger than you initially think – chances are you”ll wish it was bigger if you start too small. Use of irregular, flowing lines and kidney shapes for your pond are far more natural than perfect circles. Break-up the perimeter with a variety of rock sizes, and be sure to have some of them stick out of the water. Not only does this create visual interest, but also a place for turtles to bask in the sun. Create a seamless transition to the surrounding garden beds by using similar plants both in and out of the water – various grasses, sedges, and irises fit the bill nicely. look at almost any natural water feature and you”ll surely find some fallen timber & stumps especially in a stream. Keep the waterfall scaled to your property – you want sound and movement, but not Niagara Falls. Make sure it fits in with your property – nothing looks more unnatural than a flat backyard with that “mole hill” waterfall. Create variation in the types of water movement – small and large falls, cascades, and riffles add different sound tones and visual appeal. Be generous with the size of the surrounding garden beds to blend the pond and stream into your yard. This really is just the tip of the iceberg, but things to think about when planning your pond. Feel free to contact us for more information.